C's piano teacher had her first child at the end of the summer and he wanted to make her a quilt. This is the result. I meant to post this earlier, but the photo was on the wrong computer and I didn't get round to it at the time. All three of the kids helped and we used up scraps of fabric from my stash. We sewed them together until we could cut 12in squares from them, not paying any attention to the grain of the fabric or any other 'rules' - it was very liberating. 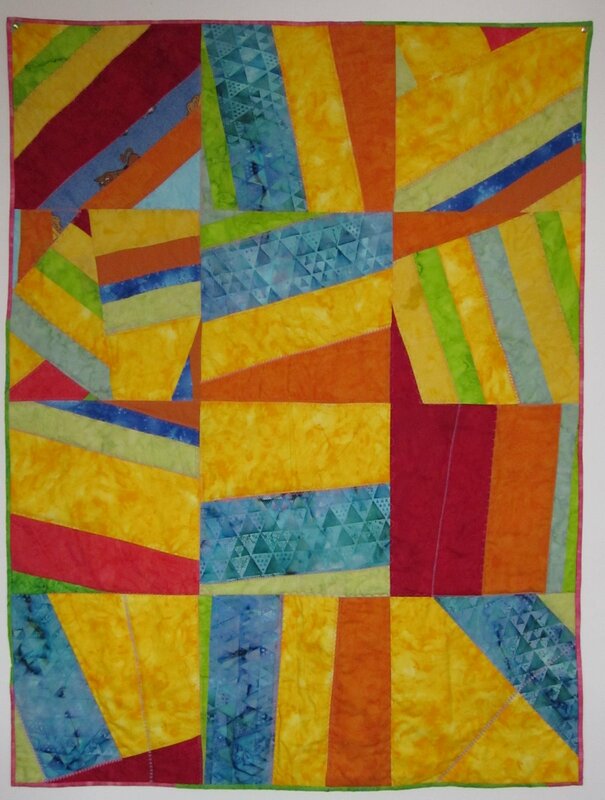 Twelve blocks were made and stitched together and then C quilted along the joins of the different pieces of fabric using different decorative stitches on my Pfaff sewing machine. We used a more gentle piece of fabric on the back from Ikea, with dancing mice on it in case it was just a bit bright for them, although I am a strong believer that babies need bright. Luckily, Kirsty, the new mum is delighted with it and it was fun to do something fabric based with the children, if somewhat fraught at times! They all want to do more and they all want results instantly!